Jose Lebron started this July 1989 game for Waterloo. He even had a quality start - but he was far from figuring in the decision. Lebron's fellow Diamonds took him off the hook for the loss by tying the game in the ninth. His Diamonds then went on to win - in the bottom of the 25th, according to a box score at Malamut.net. Lebron's hand in the game was six innings, three runs given up, one earned. He got that start in his second year as a pro. He went on to see time in seven seasons, but he never saw AA. 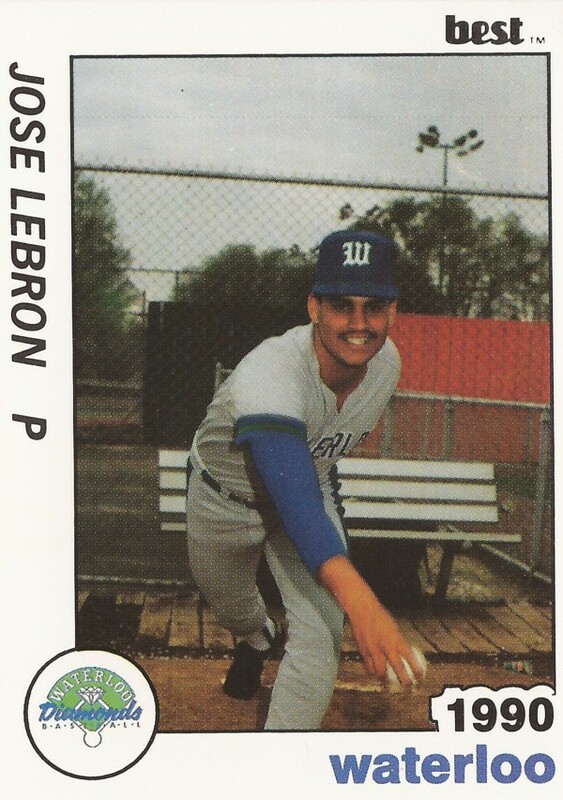 Lebron's career began in 1988, signed by the Padres as a free agent out of his native Puerto Rico. Lebron started with a brief stint at short-season Spokane. He then finished out his first season in the rookie Arizona League. In 25 outings on the year, Lebron had a 5.61 ERA. He moved to single-A Waterloo for 1989, playing two seasons there and part of a third. He went 2-9 in 1989 over 34 outings, 20 starts, his first year there. In his second year, he went 7-14 in 26 starts. For 1991, Lebron split time between Waterloo and high-A High Desert. Between them, he went 4-6, with a 5.82 ERA. He returned to High Desert for 1992 and had perhaps his best season. He went 10-5, with a 3.30 ERA over 24 starts. But Lebron isn't recorded as playing the next season. Lebron came back for five relief outings with the Padres back in the Arizona League in 1994, then two outings in the rookie Gulf Coast League with the Expos in 1995, ending his career.